For collectors of high-end real estate, there’s no greater satisfaction than adding to one’s portfolio — especially when that shiny, new home is crowned with a jewel no one else can call their own. In Miami’s luxury housing market, that gem is a rooftop swimming pool, and for two South Florida homeowners, it’s more than just an enviable amenity — it’s a chance to make a pretty penny (well, several million dollars). The reason? If you want a rooftop pool of your own, chances are, you won’t be able to build one, thanks to strict zoning rules that limit rooftop construction. “We’re not allowed to do that anymore,” says Paul Fischman, principal of Choeff Levy Fischman Architecture + Design (CLF), a Miami-based firm that caters to big-name clients, including New York Yankee Alex Rodriguez. A few years ago, CLF was commissioned to re-design a waterfront home in the Venetian Islands. The owner, Jerry Goldfarb, had purchased the property from a developer, who stripped the house of its modern character, replacing the elements with classical details that “dramatically clashed with the home’s design and intent,” Fischman said. 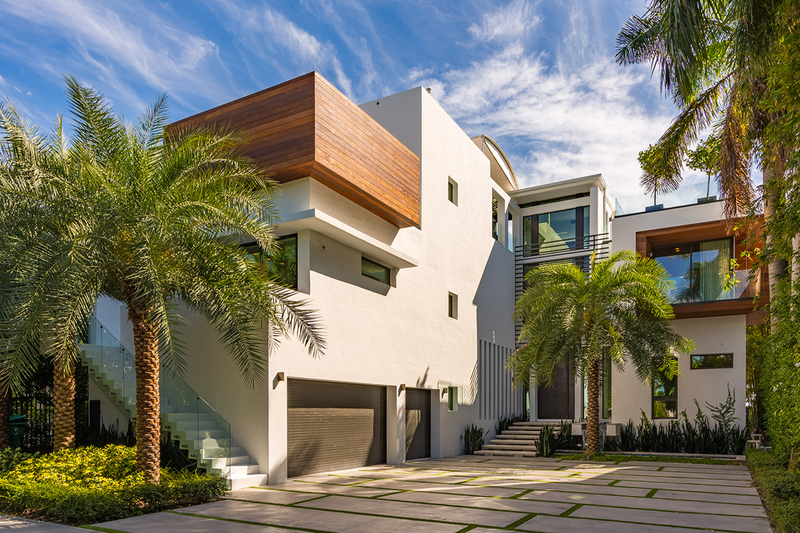 Designed by Choeff Levy Fischman Architecture + Design, Villa Venetian has a Tropical-Modern style. What the Goldfarbs’ new home did have, however, was an infinity-edge pool on its roof, complete with staggering views of the Intracoastal Waterway and downtown Miami. Since there was already a pool there, Mr. Fischman only needed to secure the necessary approvals to improve upon it — this alone, was challenging. With the help of Miami-based pool design firm Aquatic Consultants, CLF was able to repair the structure, reinforce it, and bolster its waterproofing. The firm also removed the pool’s infinity-edge, replacing it with structural glass that offers dramatic views over the Intracoastal. Oh, and there are underwater speakers to boot. The home has seven bedrooms and nine bathrooms. Mr. Goldfarb recently put the 7,961-square-foot house on the market for $16.95 million. Thanks to Fischman, the Tropical Modern-style house now boasts an airy open-floor plan, seven bedrooms and nine bathrooms. The redesign, combined with the rooftop pool, has proven to be a good investment, considering the property was listed for just $6.9 million before the Goldfarbs bought it. Not far away on North Bay Road, the only other single-family home in Miami with a rooftop swimming pool is also for sale. The ultra-modern manse belongs to Christian de Berdouare, the real estate-loving owner of the restaurant franchise Chicken Kitchen. 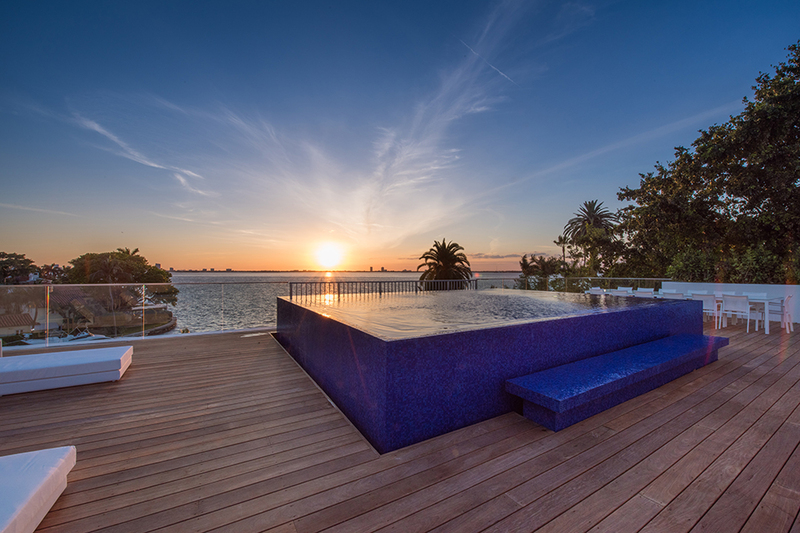 The home boasts a 3,500-square-foot rooftop terrace with a four-foot-deep swimming pool, as well as jaw-dropping sunset views over Biscayne Bay. The restaurateur, who owns a collection of homes on the same street, acquired a permit to build the terrace before the city’s planning department implemented the new codes. He listed the property for $35.9 million in 2015 — before the home was even finished. Christian de Berdouare’s Miami Beach home features a 3,500-square-foot rooftop terrace with a swimming pool. “It’s almost like your backyard is on the roof with 360 degree views,” says real estate agent Mirce Curkoski, who is listing the property with Albert Justo of ONE Sotheby’s International Realty. Mr. Curkoski explained that a number of details factored into the home’s asking price, including, but not limited to, its location, the size of the home, the views, the rooftop amenities and the custom-designed furnishings.